Scene from the 2005 Customer Appreciation Breakfast. That first location was tiny in comparison to the store today and it occupied a small corner of the Lakewood Shops, near Ardessons Shoe Repair & Shoes Shop, another long-respected Lakewood business. 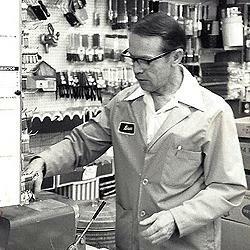 Since the early 1950’s when Bruce Tyler bought the place from Russell Fry, Lakewood Hardware & Paint has been, not only a family business here, but they have been part of our collective Lakewood family. Owner Donn Tyler began working in the store at age 13 and continued helping throughout his schooling at Clover Park High School, then TCC, eventually taking over from his dad. From a very early age, Donn has known the successful formula for business—treat your customers well, with the promise of a good product and service, and at a fair price. He says the best part of his job is the opportunity to get to know and help his customers, turning their problems into solutions. Another aspect he enjoys is being able to work around his talented and trusted staff that he is selective about bringing on board. Employees are loyal to Donn, no doubt because he is as generous as he is humble. His love of Lakewood can be seen in the projects he involves himself in fully; Lakewood Rotary (especially the playground structure at Ft. Steilacoom Park), Lakewood Historical Society and the Eagle Scouts, among others. In his free time, you will find Donn fishing on Lake Louise, a quiet pastime he deserves after logging up to 20,000 steps a day in his store. He is sharing what he has learned over the years —about paint, and plants, and plumbing and thingamajigs—to son, Skip, who will one day be a third generation Lakewood business owner. However, retirement won’t happen anytime soon for Donn; he is fit and has energy to spare. 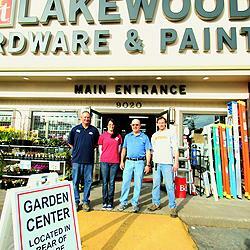 Lakewood Hardware & Paint has won many civic and industry awards, some recently, and their slogan is “Friends since 1948.” Everyone is invited to attend their popular Customer Appreciation Breakfast in the store at 9020 Lakewood Dr. 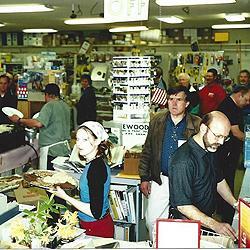 S.W., held annually to give folks a tour around the store and to thank their many happy customers.